While it still seems like the weather is feeling March Madness here in State College, with all our wavering between warm and cold, rain and snow, I spent a couple of days of my spring break in the panhandle of Florida, camping, letting my skin remember what humidity is, and, of course, herping! While the only herps I’ve seen up North so far are spring peepers, the season is considerably more advanced down South. In the Apalachicola National Forest and surrounding areas, I encountered temperatures >80 degrees, trees with leaves, and even got a mild sunburn. In the midst of driving to campsites and hiking, I also stumbled on a small sampling of the huge herp biodiversity present in this forest. 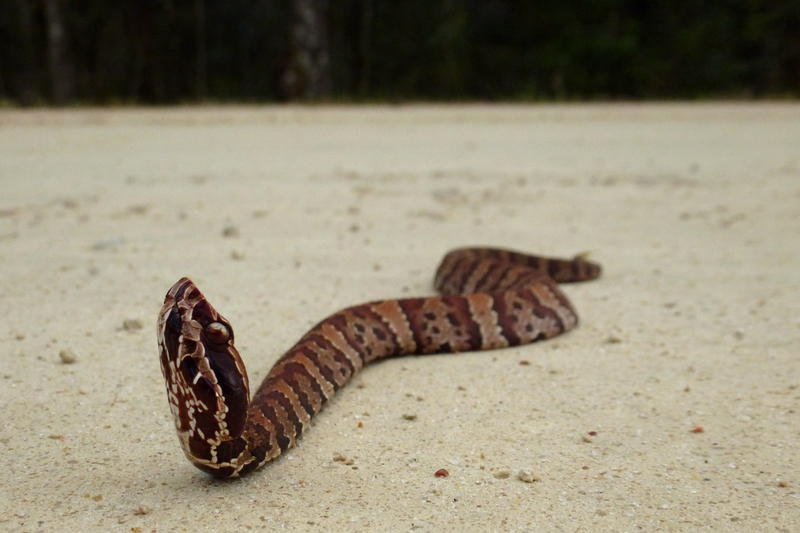 The first herp I came upon was this juvenile cottonmouth (Agkistrodon piscivorus) on the road to my campsite. His stopping in the middle of the sand road made him a nice target for a huge pick-up barreling down the road, but, after some creative car parking and arm waving, I managed to convince the other driver to leave this little fella in a non-flattened condition. Not old enough to have any hairs on his chinny-chin-chin. This little bugger was all of 16 inches. 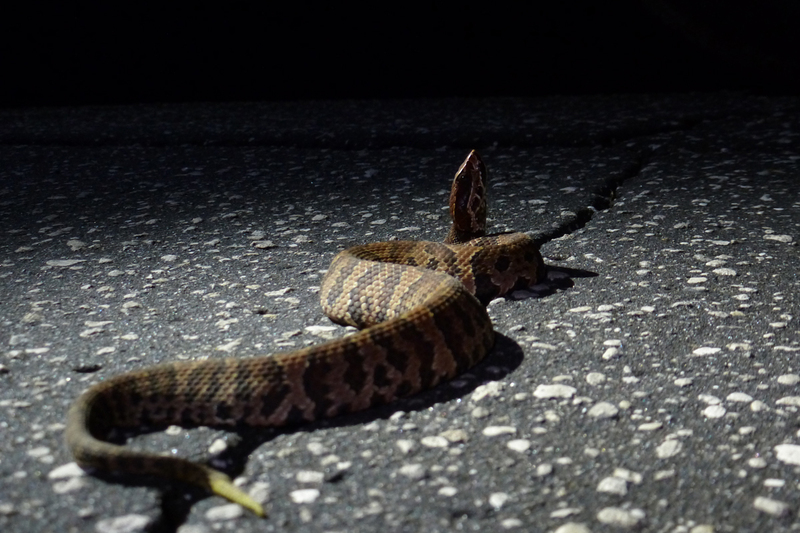 As I prepared to use my handy snake hook to help him off the road, this snake was kind enough to give an open-mouthed smile for the camera with a cottonmouth’s trademark, white grin. No, I was not dangling any delicious rodents just out of the frame. Much of the forest consists of pine flatwoods, but there are also sandhill areas and intergrades between these habitat types. In these areas, I found plenty of our old friends, the Eastern fence lizards (Sceloporus undulatus). Both males and females were out basking, and in some cases, beginning to establish territories for the upcoming season. I also found a young male with fully developed badges who was only 44 mm long (snout-vent length)…an early bloomer! A male fence lizard surveying his domain. 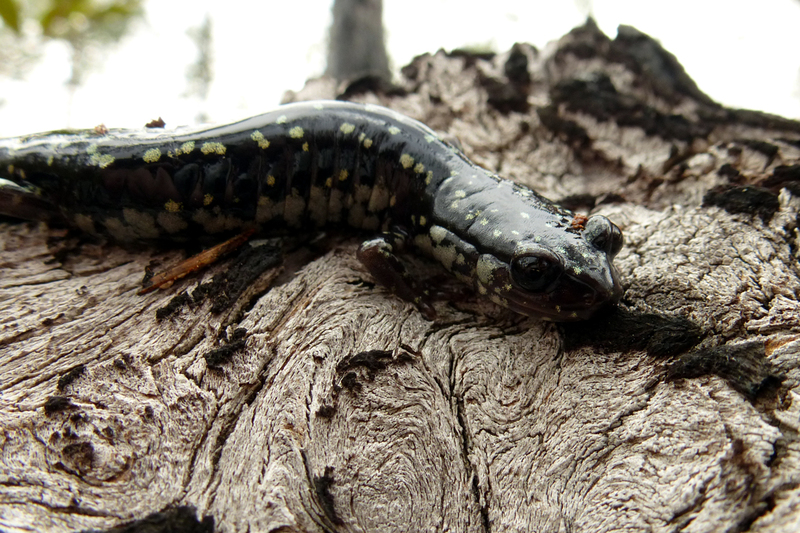 In the amphibian category, I turned up a few Southeastern slimy salamanders (Plethodon grobmani) by rolling over downed logs (and carefully replacing them!). This species is part of the slimy salamander complex and has a neat pattern of white blotches underneath and golden flecks above. I also traveled to Ochlockonee River State Park in Florida, right next to both the National Forest and St. Marks Wildlife Refuge. This was a neat little state park with a few trails and some great opportunities for canoeing/kayaking on the river. The view from the riverside trail in Ochlockonee River State Park. The park also had some interesting animals, including even a mammal, the generally rare, but locally common white squirrel! These squirrels are just mutants of the normal Eastern gray squirrels (Sciurus carolinensis), that were introduced to the area within the past century. They’re not albinos, as they still have pigments in their eyes and usually a darker stripe down the back, but they do appear rather striking. I had no idea that these squirrels were in the park, so I was initially pretty surprised to find one hanging out right next to my campsite. 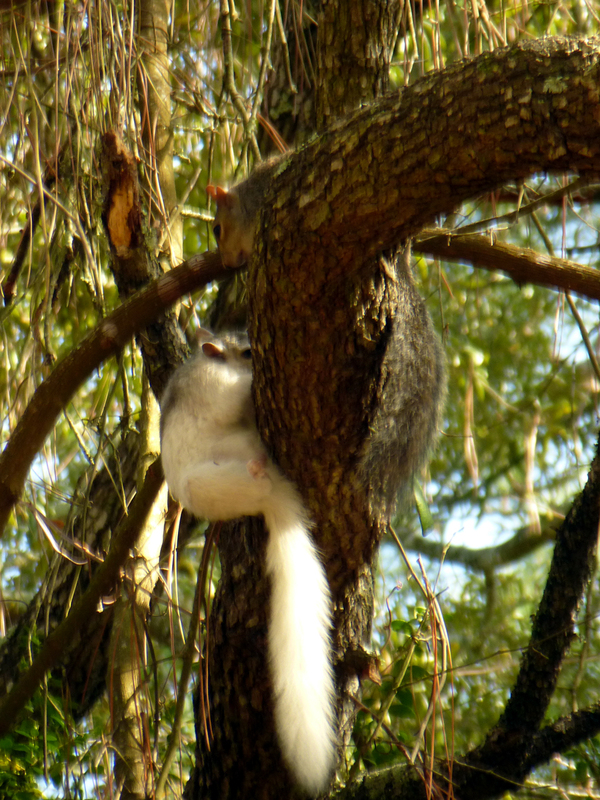 A slightly blurry picture of one of the white squirrels in the park. You can see the dark eye and beginning of the darker back stripe in this photo. Other squirrels seem to treat them normally, as the normally pigmented gray squirrel seen here was doing his best to court the white one! Of course, the park also has an abundance of herps. 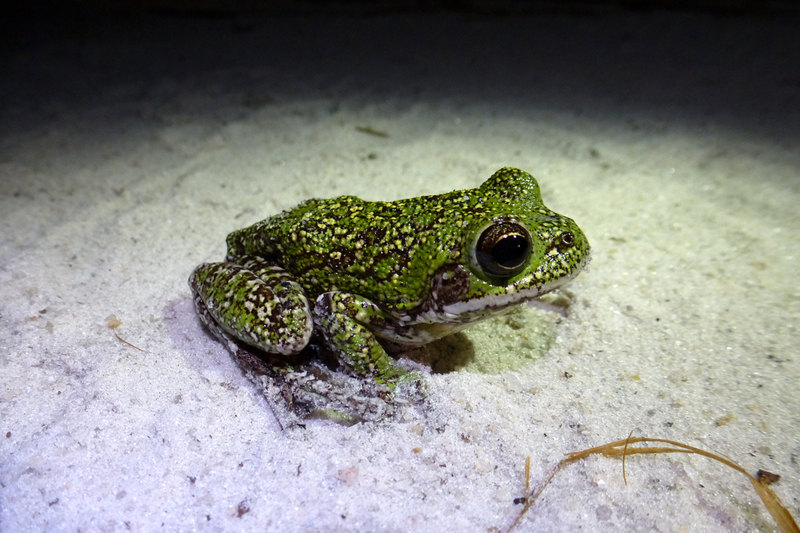 I came across several barking treefrogs (Hyla gratiosa) on the sandy trails at night as they were moving to and calling in the flatwoods ponds. A barking treefrog pauses for a quick snapshot before continuing its journey to a nearby chorus. 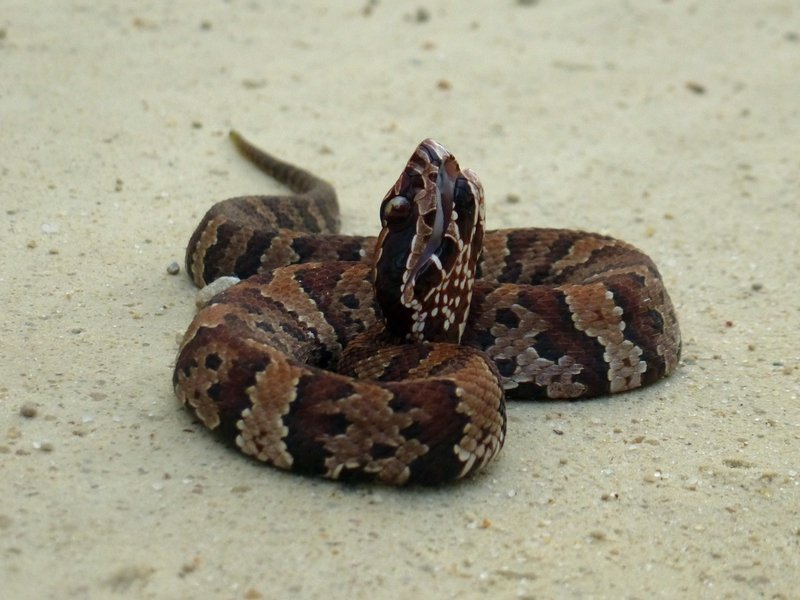 The last herp of the trip in Florida was the same as the first, a juvenile Cottonmouth crossing the road. This one picked the same characteristic posture as the first and also had a very pretty yellow tail tip which is common among some juvenile pitvipers. As field season ramps up in the lab, we’ll have more research updates right here (as opposed to updates on recreational herping). In other news, the lab is also preparing to send a contingent to the annual meeting of the Society for the Study of Amphibians and Reptiles (SSAR). After dominating the awards last year, we’re off to a promising start this year. Both Mark Herr and I received 2015 SSAR Conference Grants from the Gans Collections and Charitable Fund covering our registration fees for the meeting! We’ll have more news on that front this summer! 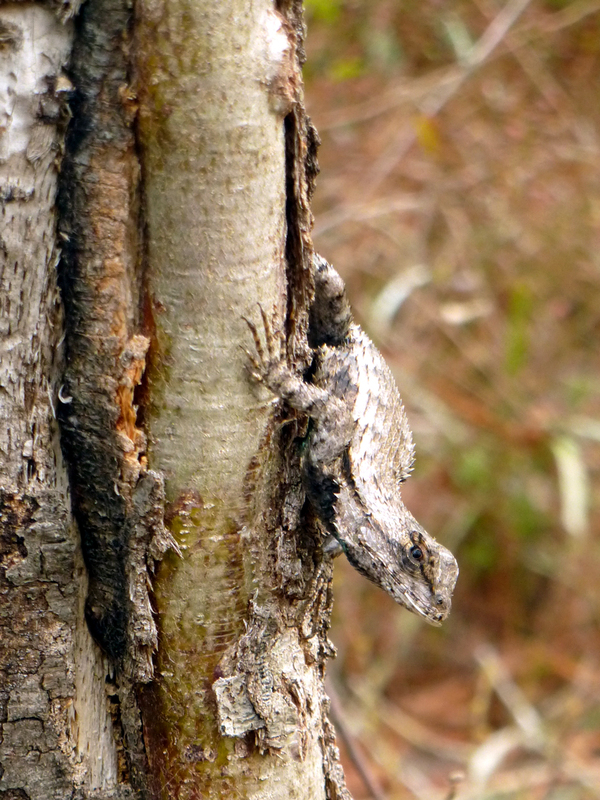 Categories: Fun in the Field | Tags: award, Cottonmouth, Eastern fence lizard, fence lizard, herping, SSAR | Permalink. As Chris explained in his latest blog post, the goals of scientific outreach are numerous. One such goal is simply to interest others in scientific research. This is fairly straightforward to accomplish with kids, and there are many great opportunities in place to interface with young adults. 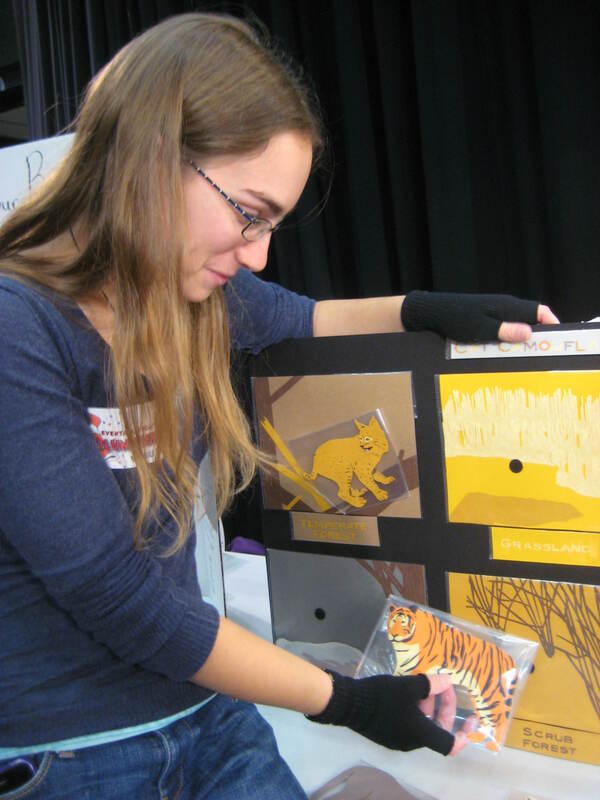 Like Science-U, there are numerous annual science outreach events established for K-12 aged kids. A few years ago, some of the Langkilde Lab participated in WPSU’s Eventapalooza, where we discussed the biology and ecology of cats. As Chris mentioned, getting people over to your table when you don’t have flashy demos or robots can be a challenge. Our solution: arts and crafts! 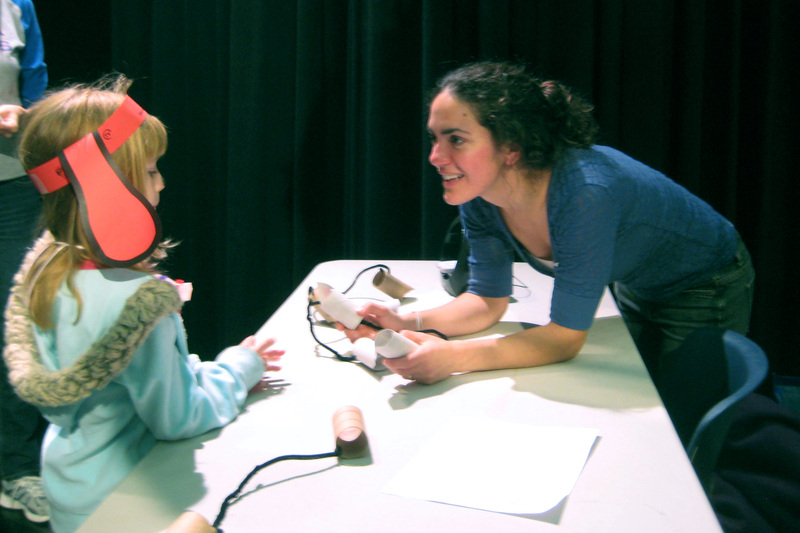 Kids made “whiskers” to learn about sensory mechanisms and crawled through a maze while blindfolded to test them out! We also had plenty of coloring pages and a matching game to see how well different wild cat species blend into their habitat. 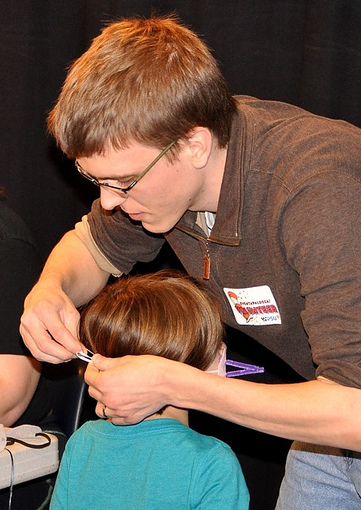 Brad helping a young adult into their whiskers! Jenny explains how cats hear. My matching game demonstrates how cats blend into their habitat. These types of events are great for kids, but there are fewer established opportunities to interact with members of the adult public. Scientific literacy—or at least interest—of adults is incredibly important, as adults utilize scientific information to make informed decisions about health and lifestyle. Additionally, adults can influence the outcome of science-related political issues. Science outreach for adults is thus quite essential, and something in which I have become very interested. 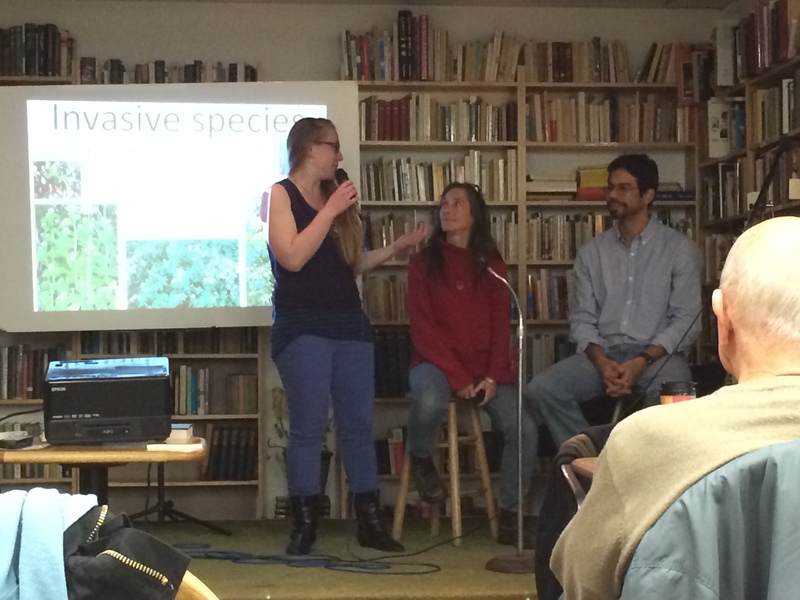 Moderator Andie Chan introduces graduate student speaker Danelle Laflower and Dr. Tomás Carlo, who spoke about Invasive Species in April 2014. Following the success of last year’s series, we had two additional Science Café events earlier this year, and two more are forthcoming. If you are located in the State College area, I encourage you to attend! 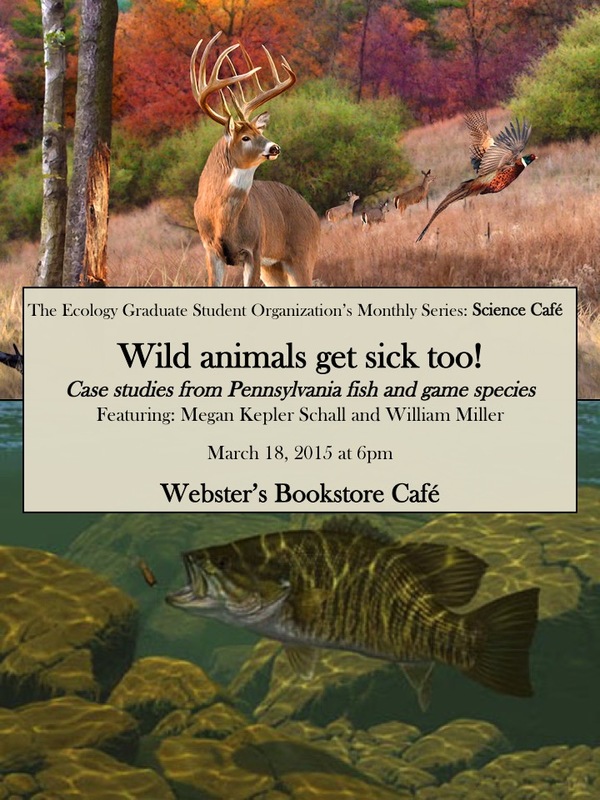 At our next Science Café (Wed March 18th at 6pm), Ecology graduate students Megan Keplar Schall and Will Miller will be discussing disease in wildlife and fisheries. This event is free and, of course, open to the public—bring your questions! More details are located below. Hope to see you there! No cover charge. Drinks and snacks can be purchased from Webster’s. Our final Science Café event this season will be on Wednesday April 8th at 6pm, investigating the topic of soils, roots, and nutrients (and why we should care about these things!). Follow the EGSO website for more information. These events are a great way to communicate the kind of research happening at the university that the community might not otherwise know about. They also provide an informal environment in which to ask questions. 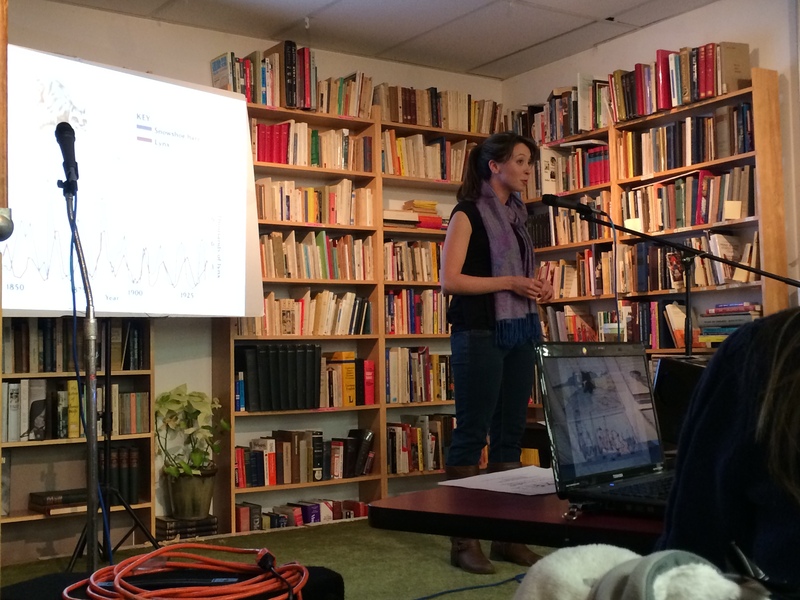 We hope the Science Café series continues for years to come! Categories: Education and Outreach | Tags: ecology, education, Evolution, in the lab, outreach, Pennsylvania, Research, science outreach | Permalink.